Gloria had quite the day today. Sometimes life can start out just terrible, and take many turns along the way. After today, Gloria knows that all too well. Children were in the Big Room doing music and movement. I was in the classroom setting up for the day. I noticed Gloria was not on the couch. Perhaps she had gone home with a child the night before. That often happens. Nope. I checked everywhere in the classroom. No Gloria. Then I had to stop my search and set up. I needed some “brass” vessels for our open air Indian market, so I opened the door to the pretend kitchen in our dramatic play area. There was Gloria – face down on a cookie sheet. Who would do such a thing? I left the kitchen door open. When children returned to the classroom, they saw my face. Shock was written all over. I told them that something terrible had happened to Gloria, and they needed to go and find her – and fix it. They scrambled. They found her. They hugged her, told her how sorry they were, got her an ice pack, and brought her to Morning Meeting. Someone suggested Gloria should be Helper of the Day. That means leading the group in singing the days of the week, recognizing calendar numbers, and identifying the weather, among many other jobs. Now, that was a great suggestion! Someone asked about Gloria’s journal. We hadn’t read it in a while. 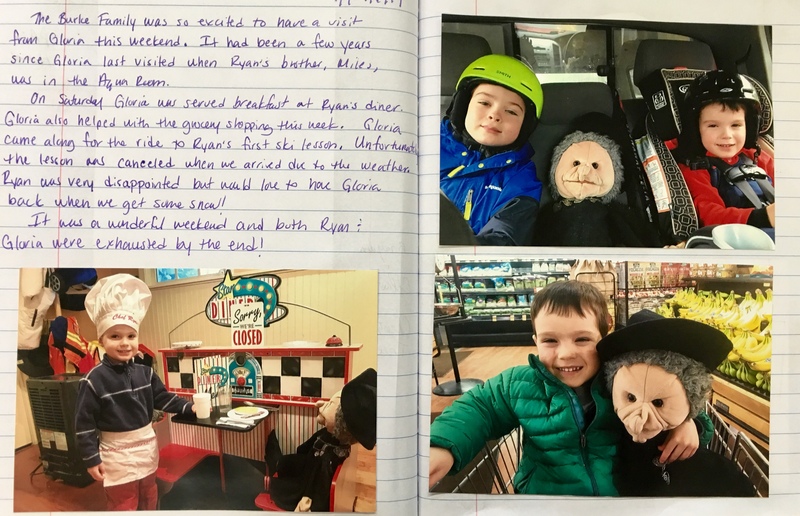 So, we decided to read the journal along with Gloria. 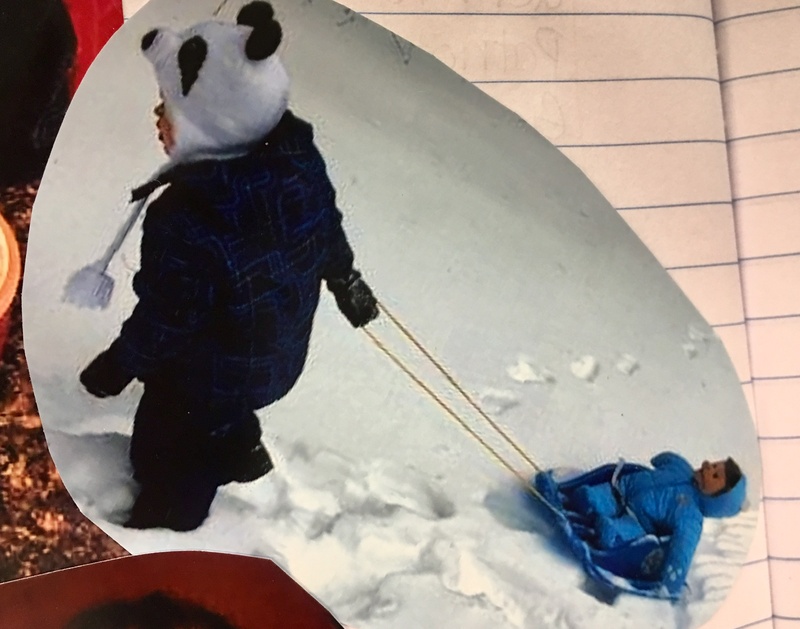 I had no idea that Gloria wore a snowsuit and went sledding! Wait…she played the piano? And she ‘camped out’ at bedtime? And she had a pancake breakfast? And rode in the cart at the grocery store? And went to ski lessons? We read page after page of Gloria’s journal. Together. Memories and stories can heal wounds. Gloria felt good. The children felt even better. The rest of the day was busy, and Gloria was included. Later in the afternoon we had a visit from a baby bunny. Everyone was eager to see the bunny. Children made sure Gloria got to see, too. 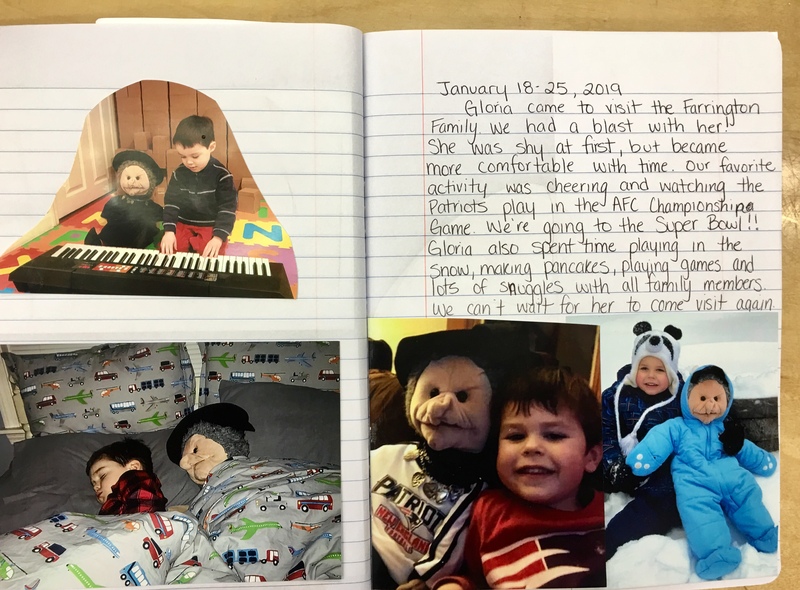 This entry was posted in behavior, Early Education, Expressing words and feelings, Gloria, Kindness, Love, preschool, Teaching young children and tagged Bad days, Early Education, empathy, Gloria, Kindness, teaching young children, Understanding. Bookmark the permalink. OMG, someone was going to bake up a batch of ‘Gloria Cookies’??? Teacher to the rescue and classmates eager to ‘make it up to her’ all day…Happy Friday, Jennie. Oh, Jennie. You bring back memories of so many of my fun times when I was teaching. That is just the kind of thing I used to do, pretending our puppets or other stuffed characters had real feelings. Children respond so easily and wholeheartedly to this third-person kind of interaction. They know it’s just pretend, and yet they know that on some level the feelings and the moral teachings are real. What a great way to get through to the kids. Thanks for sharing this post. You said it well, Anneli. Children are far more open to learning from a puppet or third person interaction. They adore Gloria! It was a great day. One of those days that you’ll all remember for a long time. 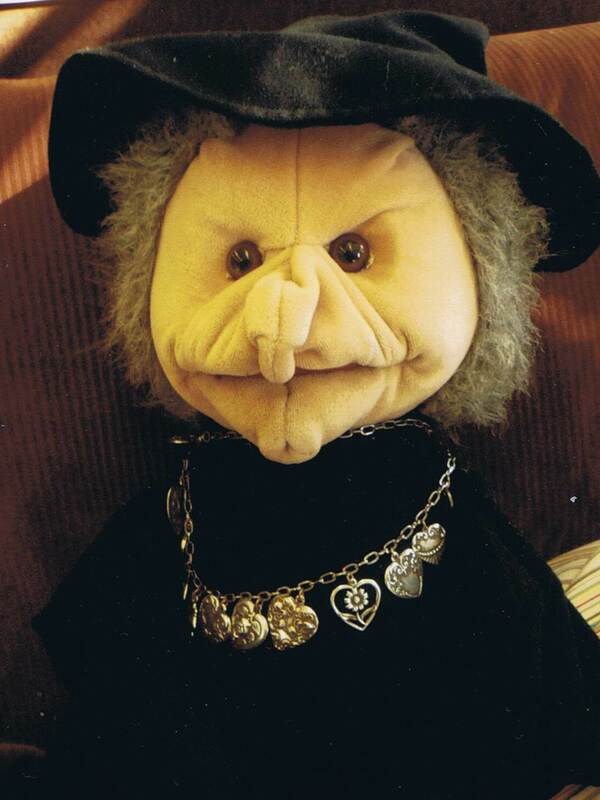 I’m heading to bed right now with sweet dreams of children making Gloria feel better. What a lesson that is. I wonder how she got there? Loved reading this. I wonder how she got there, too. It certainly opened the door for an important lesson. The parent of the child who took Gloria sledding told me in frustration that when they were sledding, “People just didn’t understand. I had to keep explaining Gloria.” Isn’t that wonderful? Many thanks, Marlene. Hope you had sweet dreams. I am so glad that children are given this opportunity to develop compassion for others. This is a critical personality characteristic we all need to develop, and I think many of us develop it in different ways. I know that my own challenges have helped me to develop it, but this is such a better way for children to learn. Thank you kindly, Jennie. I would like to give you a Teacher of the Year award if I had one to give. You are such an inspiration for me, and I know that others feel the same way. Thank heavens that there are still teachers like this left in this world. Thank you so much, Anne! Yes, these are the most important things for children to learn. I think compassion and empathy are life skills, and at the preschool level they’re far more important than learning how to count or write. Gloria is an amazing teacher. I can so relate to this. I have a number of stuffed teachers as well. Most of mine are named Ann and Andy, and one pair, particularly precious, was made for me for my graduation from college (yes, it is true) by “Little Grandma,” a grandma who was made tiny via experiments in Germany during the Nazi era, and she was a German too! Her daughter’s husband built all tiny furniture for her so she was always able to create wonderful things. So nice to remember people from so long ago in my life, and what wonderful gifts they gave in the way of knowledge and good memories. Thank you, Anne. What a story! Memories are precious. This was an object lesson in ‘inclusion’ indeed. Marvellous to see. No confessions. Just silence. Hmm… Gloria is an amazing teacher. Best to you, Pete. What a sweet story. These children learned so many good things. What a cool story. Gloria is one lucky lady. My kindergarten granddaughter would love you as a teacher. Your students in MA are lucky! So how did she end up face down on a cookie sheet? Lovely post, Jennie. Your guess is as good as mine! Thank you, John. Oh dear, poor Gloria. I am glad the children all rallied around to remedy the situation. Thank you, Robbie. It ended as as a good lesson all around. Hahaha so cute! Never solved the mystery? Nope, never solved. Thank goodness it turned into a great day of learning. Thank you, Luanne. What a great teaching opportunity with real life lessons. So glad Gloria and the kids are OK. Thank you, Frank. Best to you. A beautiful post! How wonderfully empathetic the children were to Gloria. That’s the whole point, isn’t it? Yes, it definitely is. Children need to learn empathy before academics. Thank you! Thank you, Carol. Gloria is a role model for kindness and empathy. Just love the last pic and the whole post, Jennie! Memories and stories have healing powers indeed! What a wonderful way to teach children about inclusion and caring for each other. Gloria is the best, Norah! She teaches children far more than I could on my own.